Last week I posted an article where I looked back on my first two visits to the forests underwater exhibit in Lisbon. I wrote this article as I was preparing to do my third visit as part of the scapetour. This was gathering of aquascapers from all around the world that took place in Europe last week. The two main events was the visit to Takashi Amano's masterpiece and a visit to the aquaflora headquarters. I ended the article wondering if my third visit would live up to my first. For start let me make clear that for personal and professional reasons I was only able to take part on the scapetour on the 3rd of March for the Lisbon oceanarium visit. So this article will focus on my experience on that day. I arrived Lisbon on the 2nd around 10 p.m, from there on I had a short drive to my hometown. A small town called Setubal just one hour south of Lisbon. My excitement for the next day was so much that instead of going to sleep I wrote last weeks article while at the same time checking out the Lisbon scapetour chat. The next day i left my house 9.30 a.m to head to Lisbon. The rainy weather was a let down as i was expecting to take some nice pictures at the Parque das nacoes (Nations park) where the Oceanarium is located. I parked my car near the gar do oriente (Orient train station) and made my way to the oceanarium on foot. Despite the rain and to make up the time i got my camera out of the bag and took some photos of the area. The Lisbon oceanarium was built in 1998 for the Expo 98 which happened in Lisbon that year. It was called the pavilion of the Oceans during the expo and renamed Lisbon oceanarium after the exposition ended. This Lisbon Oceanarim it stands on top of a pier and some people have likened its design to that of an aircraft carrier. At the time of its opening it was the largest public aquarium in Europe. Today is the 3rd. The oceanarium houses a large central tank, and four smaller tanks surrounding it. These ones are separated from the main by acrylic glass walls which to the viewer makes it look like he is looking through a wide expansive ocean. The side tanks also represent four different oceans and environments of the world. The Florestas submersas exhibit is on area designated for temporary exhibits, these ones change over the years and function as a way to keep the exhibit fresh and get people to come back again. I took some photos and quickly made my way to the ticket hall of the oceanarium. Through the Lisbon chat i then found out some of the members of the American group were in the gift shop. I made my way there and met Brian James who was the organizer of the tour, i also met Art comisso, Han tran and Hiep Hong. I was a bit shy at the beginning as they all seemed to know each other and i was the only outsider at that moment, however they were very friendly and made me feel right at home. We proceeded back to the Ticket all to get the tickets and there i was introduced to the rest of the group. Brian Covey, Therese Neal, Lesllie Germain, Juan Gabriel, Jill and also Shawn from the aquascaping Podcast. It was a bit overwhelming at the beginning to even remember all their names, but we were of to a good start and i was sure our shared passion would do the rest. As we were waiting to enter we were joined by Jurijs Jujaevs from and Thomas from Germany. Jurijs is a world renowned professional aquascaper and he was also part of the team that build the Florestas submersas aquascape, i previously met him in the UKAPS aquascaping experience and in Germany at the EAPLC party. Most of you will most likely remember him from the Scapefu Podcast. He is very knowledgeable, friendly and always willing to help. 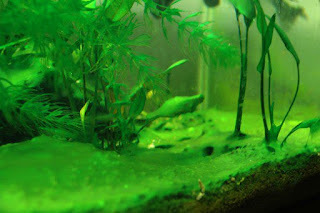 His presence allowed the group to get some inside information into the aquascape and also the way it was build. We also had a Portuguese tour guide, she was very nice and helpful. She seemed very surprised by the groups enthusiasm and knowledge of Takashi Amano and aquascaping. I explained her that the entire group was composed of aquascapers themselves. She also announced that the exhibit, which was scheduled to be shut down this year will keep going for as long as it is possible to keep this tank running. She guided us on our way in and at this point i was paying close attention to the reaction of the group as they entered the room and gazed upon the aquarium. In their own way i could see they were all blown away by what they were seeing. However i myself was quite surprised. My first visit to the aquarium was just a few weeks after its opening, the second time was roughly a year and a half ago, the tank was matured by then. But this third time the tank was way more grown in, the plants took over the entire tank and in some areas they are even coming out of it. I was not blown away like the first time, but i was still having a feeling of rediscovery. This made my experience even better. I did not want to ruin my American friends experience, so in these first moments i stepped back and let them enjoy the aquarium occasionally chatting to Jurijs or whoever passed by. Because this was my third time, i did not felt the need to take loads of pictures and videos like in the first two visits. So i was able to sit back myself and just enjoy the tank and the amazing soundtrack. I got to say, the soundtrack plays a big part in setting the mood for this tank. The Florestas submersas soundtrack by Rodrigo Leao sells at the gift shop and i decided there and then that i would buy it before the end of the visit. After one hour the group moved on to see the main exhibit, i'll be honest i have seen this exhibit so many times that i had no interest in seeing it again. All i wanted was to stay in this room staring at the 40 meter masterpiece. I could tell i was not the only one. However as we were all part of a group we all decided to go together, Jill had quite a hand in persuading me as she said she wanted to do a large group photo. The main exhibit still held a few surprises for me as we were allowed into the backstage to see the heart of the oceanarium. This is basically an office where the staff monitors all the parameters and workings of the aquarium with the help of computers. The guide explained all the systems have a triple back up to make sure the tank keeps running even in the event of power loss. The backstage was not much different of what i imagined it, a large floor full of filters and pumps. Having worked with swimming pools in the past it was really nothing new, however the scale of it is what makes it impressive. We were explained the different types of filtration and equipment used and after that we were shown the area above the tank were all the fish and sharks are fed. Each species seems to have a different way for the staff to feed them. We also found out that sharks do not eat nearly as much as we think they do. From here on we proceeded to the rest of the salted water tour. As i was a bit bored of this area, i took the chance to get to know my tour friends better. In the end of this part of the visit we took our group photos. We didn't all fit in one photo, so two had to do the job. And after this we went for lunch before heading back into the Florestas submersas. A few of the guys decided to go out for lunch, if you ever go to the oceanarium you should know that you can go out and come back in to the exhibit. For this you only need to go to security and show them your ticket. They will put an invisible stamp on your arm which then can be read by a machine on your way back in. While many of the guys went out, i went to the oceanarium cafeteria. I am really glad that i did, during lunch i had a great chat with Shawn from the Aquascaping Podcast. We discussed a lot of topics, going from how it would be possible for ADA and the oceanarium to run the Florestas exhibit permanently, to how the aquascaping podcast came to be and the state of the aquarium industry in the US. 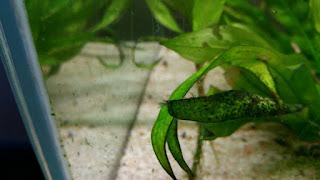 Actually this topic was something i was able to discuss with various of the group members and they all believed the US freshwater aquarium industry is still lagging behind Europe and Asia and that this not only makes the hobby quite expensive for them but also limits their creativity. I often made questions to really understand the differences. My chat with Shawn was a high point of my day as i have been listening to the Podcast from its beginnings. And know i can say i had the pleasure of meeting a member of both the aquascaping and scapefu podcasts. We then went back in to exhibit and stayed hours, i was one of the last ones to leave the exhibit. Through this time i had a lot of fun and really got to meet the group quite well, spent some good time chatting with Leslie, Hiep and Brian James. Signed many IAPLC books, as many of them specially Hiep Hong were using it to keep a record of the people they met on the visit. Took some pictures myself and we did take another group photo. It was really relaxing to stay so many hours gazing such a masterpiece, considering its not gonna end this year i am now sure this was not my last time. The low point was the refusal of the oceanarium to allow us to see the backstage of the 40 meter long tank. This was due to a misunderstanding, as the tour gave us the right to visit the backstage of the main exhibit only, to see the backstage of florestas special permission needs to be requested. It was assumed both backstages were part of the package so a request was not made. To soften the blow as we were leaving we did get to meet the two members of staff from ADA that every night dive into this tank to maintain it. It was obvious to me how much of an honour it is for them to be the custodians of Amano's swan song masterpiece, however it was also easy to see it is not easy for them to be away from Japan for such long expanses of time. My third visit endend up with me at the gift shop buying the the soundrack from Rodrigo leao. This visit may not have blown me away like the first, however it was an amazing visit in its own right. It was mostly because of the company of such good friends that are as enthusiastic about aquascaping as me and because i spent the whole day in, meaning i was able to enjoy Amano's masterpiece in a way i probably never expected to be able to do. It felt like time stopped while i was there and when i noticed the whole day had gone by. I hope there's more scapetours and most of all that i can attend and meet my new aquascaping friends again.